Kriya yoga is a way of life and encourages simple living in tune with nature with high ideals; -leading to God realisation and liberation from the cycle of birth and death culminating in Soruba Samadhi or golden light Samadhi which is the total transformation of the physical, vital, mental and intellectual and spiritual bodies. 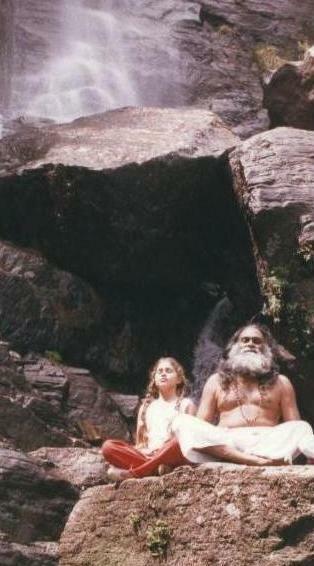 Yogi Ram Sunthar met his first guru Yoga-Swami of Jaffna, Sri Lanka, at the age of seven and was blessed by him. Yoga Swami’s guru is Chellappah-Swami and Satguru is Kadai Swami. A Samadhi shrine and a granite temple was built for Kadai-Swami, at Kadai-Swami Lane, off Navalar Road, Vannar-pannai, Jaffna, Sri Lanka (birth place of Yogi Ram Sunthar). Yogi Ram Sunthar’s grand father Appaiah Pillai, a wealthy businessman contributed for this Samadhi shrine and construction of this Temple. Kadai-Swami attained Maa-Samadhi on Aadi-Amavasai day. Every year on (Aadi-Amavasai), Aadi-Kool (soup) is served for poor people in memory of this saint. Yogi SAA Ramaiah came to Jaffna, Srilanka to pay homage to Yogaswamy. Yogaswamy also edited his journal called “The Sivathondan” ”The Servant of siva” which was published by Sivathondan Niliyam of Jaffna Srilanka. His songs and sayings called “Natchintanai” or “Good Thoughts” was published by his devotees. He initiated several successors, one is Sivaya Subramuniya swami of Hawaii, carried yogar’s message to USA. Another is the then governor general lord soulburi’s son. Yogi Ram Sunthar did yoga sadhana with Vellai Ananda swami. This saint lived on no food or water for 6-years during his intensive yoga sadhana. Didn’t even move from the spot during this period. People may visit and get his blessings, at the following address: Krumarippatti, Thiruvannamalai, South India. A great poet saint trained by Sri Aurabindo of Pondicherry, South India, in Integral yoga. 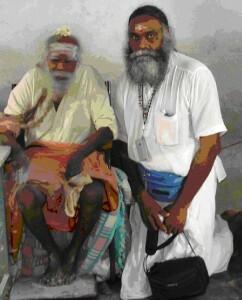 Established his own Ashram and school in Chola-Puram, South India. Authored many books in Tamil, French, German and other languages. As directed by Yogi SAA Ramaiah Yogi Ram Sunthar visited this saint and practised Prana-Yoga, under his guidance. He attained Nirvikalpa Samadhi in 1989 and his Samadhi was prepared by Yogi SAA Ramaiah, Yogi Ram Sunthar and Melanie Sunthar. People should visit Yogi Suddanantha School in Chola-Puram, Siva-ganga in South India and do Kriya Yoga sadhana. The holistic five – fold path of scientific practice of Yoga is a vast and ancient Gospel of scientific mysticism that has been developed by the great Masters of Yoga the world has ever known. Re – discovered by Babaji in the 3rd century, KRIYA YOGA is the same science that the great LORD SHIVA gave millenniums ago to his Shakthi PARVATHI DEVI at Amarnath, in Kashmir. Very slowly but steadily the world is taking to KRIYA YOGA. YOGA may be defined as “the scientific art of God Union and Perfection. KRIYA – a form of Raja Yoga, literally means an activity performed with awareness or scientific practical technique. Thus KRIYA YOGA is a” series of scientific practical technique which assists the practitioners to realize his potential and to tap the latent sources of inspiration and higher states of consciousness. Regular and sincere practice of KRIYA YOGA brings about an increasingly wider perspective of self realization. In addition KRIYA YOGA practitioners are trained in Yogic Dietary practice, the study of the Holy Scriptures of the 18 great Siddhas, inter – religious harmony, world peace and environmental protection, and are expected to perform Karma Yoga, including 8 hours of daily productive work / studies. 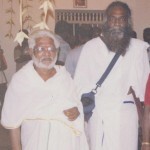 Yogi Ram Sunthar is with Swami Murugesu of SriLanka, a Gayathri mantra siddha. Yogi SAA Ramaiah and Swami Murugesu were both trained together in the secreat of Kundalini yoga by the great Kannaiah Yogi of Andrapradesh. Yogi Ram Sunthar was trained by Swami Murugesu in Gayathri mantra Yagam and was initiated into Gayathri Mantra yoga and practised under his guidence continuously for three years. Yogi Ram Sunthar performed the most powerful Gayathri Mantra yagam under his guidance.